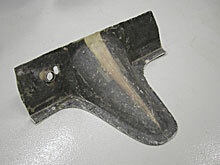 The transmission cover panel was removed and the tubing was cut. I left about 1/2-inch on the inside of the car. 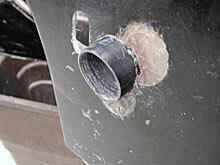 I plan on drilling a hole through this flange into the column and tapping the hole in the column to accept a small bolt. 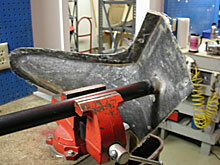 This will keep the column from moving in or out and spinning in the mount. The insulation and carpet on the floor should cover the inside flange. The outside (engine compartment) piece of tubing will remain as it is and be molded to the toe board with filler to create a seamless look. 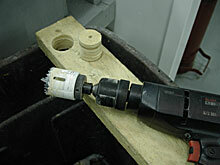 I used my 1 3/4-inch hole saw to cut a piece of wood for a drill guide in the plastic. 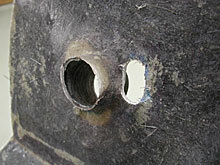 Guess what - the ID of the hole saw is exactly the ID of the tubing (blind luck). The wood plug was tapped in place and the tubing was drilled to 1 3/4-inch ID so the column will slide nicely into it. 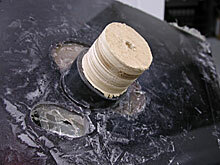 You can't drill for very long without heating the plastic so it was drilled in stages. The new thinner wall of the tube in the engine compartment should give it the look of steel. The thick inner area (with the bolt) will give it strength, this side is just for show. Here's a quick view of the inside after the plastic tubing was cut and drilled. 2 more layers of glass were added after this photo was taken to further reinforce the area.